For any organisation to thrive their people need to be ‘on fire’. At a recent meeting I had with one of the five founders of Innocent Drinks, Dan Germain said that ‘… whereas people in many organisations may be 35% or so engaged and creative, at Innocent we are 100% ‘on fire’. And my job is to keep us so’. An organisation is only going to thrive if its people are alive, engaged, ‘crazy about work’. We no longer want ‘homo mechanicus’, ‘hands only’, we want ‘on fire’, ‘crazy’, creative, can-do and customer obsessed homo sapiens who can bring their whole self, body, brain and soul to work. folk who create better organisations by moving them to and keeping them in ever greater ‘prime’ condition. • There are no rules or systems. • There are explicit detailed rules, procedures and also invisible or implicit rulebooks going back decades describing the rituals and ‘the way we do things around here’ – many of which are now out-of-date. 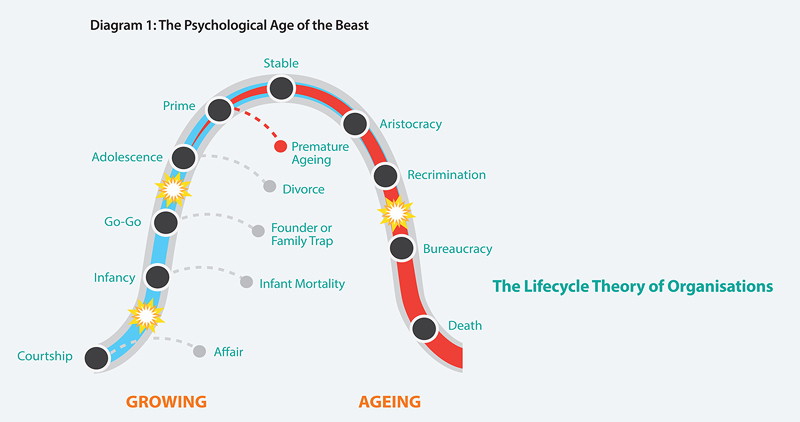 Of course, different parts of any organisation can be at different points on the lifecycle curve. The lifecycle illustration above is based on the excellent work of lchak Adizes, one of the world’s leading experts on improving the performance of business and government(1). What any organisation needs to thrive forever at ‘prime’ is the best of both lists of characteristics. The ever better organisation needs to have the best of the left and the right sides of the lifecycle – or the left and right ‘hands’. The right hand is often associated with what is correct, orderly, systematic and predictable. If you don’t look after the right hand you may well die today. The left hand is more associated with experimentation, creativity, innovation and is less predictable. And if you don’t look after the left hand you will die tomorrow. Any organisation, if it is to thrive short, medium and long term, needs characteristics of both hands. It needs the best of control and creativity. • 2D (‘within the box’, incremental, evolutionary thinking) – doing everything you do ‘better’ to delight your customers and all other stakeholders. • 4D (redefines your world, a fundamental shift) – a new world is emerging and you need to spot it early to stay alive – or, if you want to be really ‘can-do’, you create this new order. Every organism and organisation needs to be smart around OD and 1D – otherwise you perish fast – and may kill people too. If the world were static, OD and 1D would suffice to survive. In a more demanding, changing or challenging world, you need to do the OD/1D AND look after 2D, 3D and very possibly 4D. When and how much you do of each ‘D’ depends on how your environment is changing. And obviously you also need to think about how much of each ‘D’ you want to bring to each and every part of an organisation. And you may want to think about the extent to which to engage some or all of your people in thinking creatively around 2D, 3D, even 4D. There can be a real tension between some, or even each, of the ‘D’s. 1D is ‘Don’t sit there, DO something’. 3D, on the other hand, is ‘Don’t just do something, SIT there’. And you never want to see mistakes or failures in the OD or 1D areas. These mistakes and errors can be ‘disastrous’ and involve untold damage. These are ‘stupid’ or ‘catastrophic’ mistakes. If you are to have a culture that also nurtures the new, you also need people to be trying things out in the areas of 2D and 3D. And because these are experiments, some will succeed and some will fail. Such successes are great. Such failures are also valuable. These are ‘glorious’ mistakes and failures. You learn and move on from these. You must be allowed to make such mistakes. In fact if your organisation isn’t having a fair number of 2D and especially 3D mistakes and failures, you are being complacent. Many more mature organisational structures are more right-handed, more 1D – they are uni-dimensional (straight line, predominantly top down, and arguably male or male-minded hierarchies). They are designed for productivity and efficiency – NOW. This is fine in the short term. However if organisations are to survive for any considerable time, they need to be multi-dimensional, allowing for all the ‘D’s’ – where all parts, at least some of the time, can talk openly in a coherent way, for maximum learning, intelligence and creativity. Along with organisational life, often goes a very 1D frame of mind – busy, busy, busy, fast time. People need ‘time out’, slow time, serendipitous time, to be ‘out of time’, much more apparently ‘idle’ or ‘stiller mind’ time, especially for 3D. Time out is not time off. So the primary structure of many organisations is 1D, the level of brain arousal amongst employees encourages sharply focused, fast, more obvious 1D thought. Many of our more mature clients are stronger on the right hand of efficiency, system and discipline and weaker on the left hand of experimentation, creativity and innovation. And to help your organisation become ever better and return to and stay at ‘prime’ you can very usefully measure how far your culture and climate is nurturing or killing off the left hand of innovation. You then need to shift the climate. 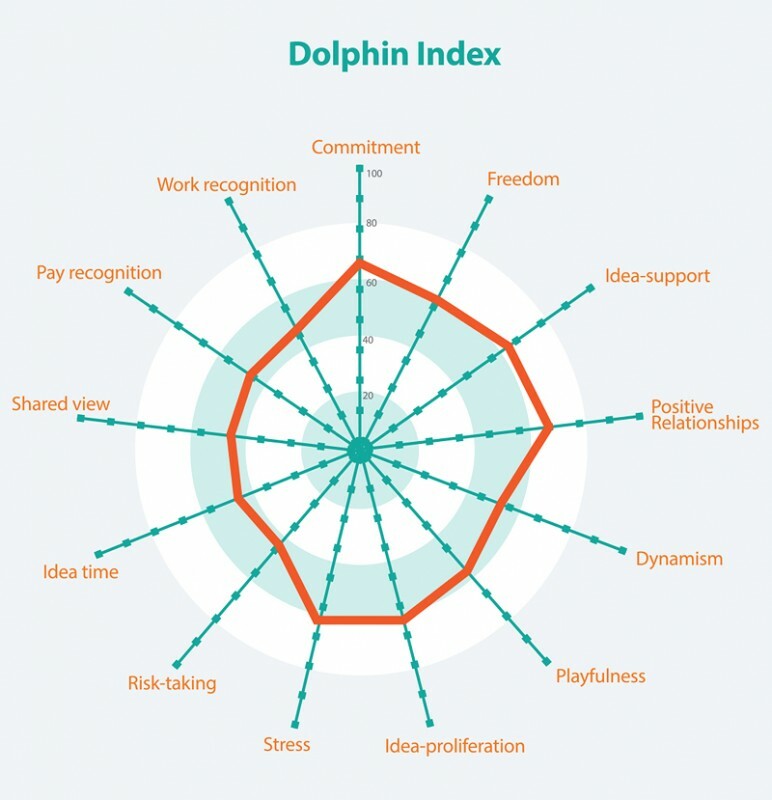 The ‘Dolphin Index’ is a rigorously researched climate assessment tool that gives you a quantitative insight into the qualitative world of culture and climate, ‘what if feels like to work around here’. The spider-gram above gives the current UK norm. 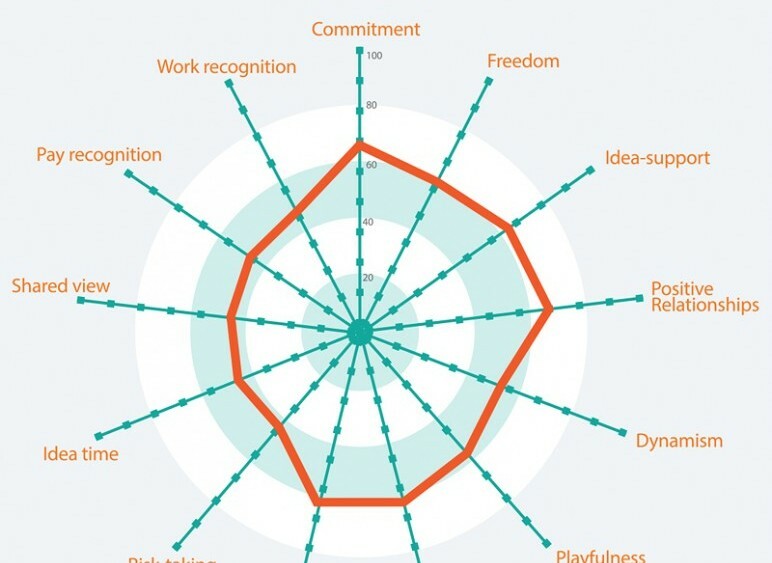 The higher you score on each of the dimensions (with the exception of Stress where a mid-score is more desirable) the more people perceive your culture to be innovative. So if your organisation is a more mature right-handed beast and therefore beyond ‘prime’ you can make the organisation better by improving your scores on each of the dimensions with the exception of Stress. The questionnaire takes about ten minutes to score and you get an immediate summary of how your score compares with the current UK norm. (We are now creating norms for other countries and industry sectors). • Commitment: The extent to which people are committed to the organisation and work is viewed as stimulating and engaging. • Freedom: High freedom work environments are those in which people are empowered to make their own decisions, e.g. about prioritising their work. In low freedom environments there is close supervision. • Idea support: Organisational support and encouragement for the development of new ideas and suggestions for improvements. • Positive relationships: Extent to which there are positive, trusting, friendly relationships between people, rather than negative (e.g. hostile, conflicting). • Dynamism: Refers to whether work is exciting and dynamic, or static and boring. • Playfulness: Refers to levels of light-heartedness and fun in the work place. Work environments low on playfulness may be seen as dour and humourless. • Idea proliferation: Extent to which other people in the work environment are perceived as having innovative ideas about their work. • Stress: High stress work environments are where other individuals are observed to be highly stressed and encountering heavy workloads. • Risk-taking: High risk-taking environments promote the speed at which new ideas are implemented. Low risk taking environments make excessive use of formal rules and procedures. • Idea time: Extent to which employees perceive that there is time for developing new ideas. • Shared view: Extent to which there is open communications between more and less senior employees. Work environments where there is an ‘us’ culture rather than an ‘us and them’ culture. • Work recognition: Do people feel that they receive credit and praise for their achievements? Or do they feel undervalued? • Pay recognition: Refers to satisfaction with pay and conditions. Do people feel fairly remunerated for their work – or at worst, feel exploited? The business question is: What is our appetite for risk? How much, and for how long should we invest in the improbable? Many organisations today state that they want to be a force for good in the world and not mere money making machines. Unilever and M&S are good examples. And to be conscious we need to ensure that everything we do and all our innovation is creating an ever better world. Consumers are increasingly attracted to products and organisations that come from an aspiration for sustainability. Not surprisingly many organisations no longer just talk about the must-have of any innovation, they now talk about ‘sustainable innovation’, that is innovation that is good for the planet and all of its people. So for organisations to be ever better and more successful they will also need to focus on this 5th C – Conscious. Conscious meaning caring about the customer, the employee, the shareholder, the well-being of all people, the health of the planet. So more than ever before we can now enable people to have better lives at work, in ways that allow organisations to be ever better by being at and forever remaining at ‘prime’, in a way that makes for a better world. It’s the best of times ! (1) Ichak Adizes, PhD (1988) “Corporate Lifecycles: how and why corporations grow and die and what to do about it”. Prentice Hall, Paramus, New Jersey. Excellent article. I also took the opportunity for seeing my organization map and I am impressed of how exactly are the results. Congratulations!